Greenlab installed a demonstration green roof on the Storage Container at the Gowanus Canal Conservancy Salt Lot in the fall of 2011. We wanted to update on the progress since it is now the second season and very active! The roof is not irrigated but the bed is designed to hold water and slow release through the gabion - wood edge. The grasses and forbes did not survive through the first season, but the sedum are absolutely thriving! 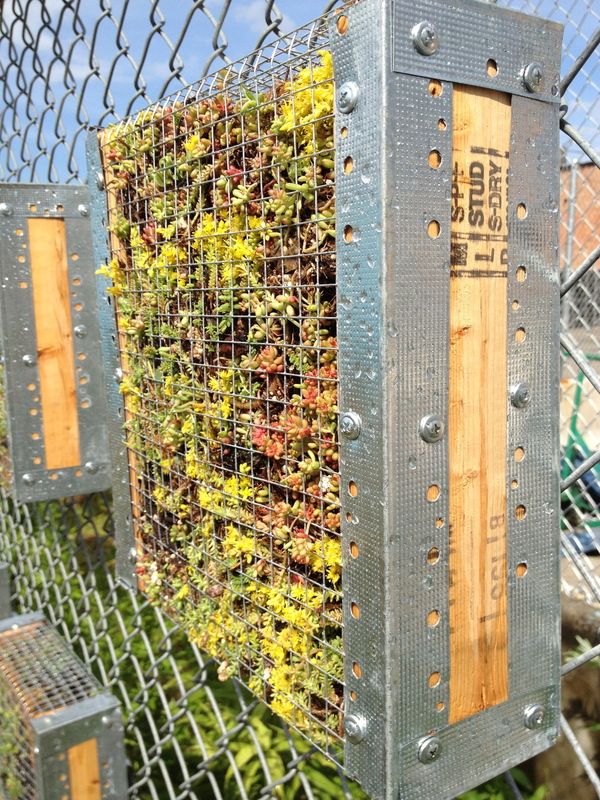 The sedum roof and honeybee hives at the Salt Lot are mutually benefiting each other - we love the fact that the green roof + gowanus compost + gowanus bee hives are making a complete cycle! September 2011 - day of install! . We planted grasses, forbes and sedum. This weekend Greenlab led a green wall workshop with the Gowanus Canal Conservancy! I collaborated with Alexandria Donati on the design and planning of the gabion modules that are now adorning the chain link fence at the Salt Lot at the end of Second Avenue near the Gowanus Canal. With the help of 15+ volunteers we built and installed 30 modules! The modules are made from a wood, mesh and aluminum frame planted with sedum propagated from our green roof. The day was a huge success - now we need another June rain!